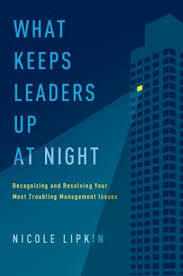 If I’m honest it took me a while to get into What Keeps Leaders…which was nothing to do with the book itself, more an indicator of my workload. Plus, it is an American book, and not specifically aimed at women so not my usual book review fodder. But when I did sit down and read it I was so pleased I had: it’s good. I’m currently working with a new management group on their individual development and I will be recommending it to each and everyone of them. In the late 1970s, Dr Susan Kobasa, a clinical psychologist at City University in New York, studied executives at the Bell Telephone Company who were experiencing high levels of stress due to the government-mandated restructuring of the company that broke up the monopoly of ‘Ma Bell’ into the many ‘Baby Bells’. She found that 3 personality traits could actually protect someone from the negative effects of stress…. Kobasa found that executives with (a) a strong sense of commitment; (b) a belief that they could exert control over their situation, and (c) a tendency to see the opportunity inherent in a problem experienced a 50% decrease in their risk of developing a stress-related health problem compared to their more pessimistic counterparts. The three traits increased their hardiness, their ability to weather a stress storm. They felt stress, but they did not let it drag them down into despondency. Anyone can develop this sort of learned optimism. She then goes on to give a story which illustrates this point perfectly. This is her style throughout the book which enhances your learning and understanding and breaks up the factual information. If you are in any type of role where you have to exert some leadership or work influentially with others, take a look at this book. I’m very pleased to have it on my bookshelf and it will be much loaned out!